The Celts marked many festivals of the sun with great bonfires - to celebrate the sun's return in spring and summer, and to invoke its light and power in fall and winter. Entire towns would celebrate and dance at the fire, hilltop blazes visible from one town to the next. 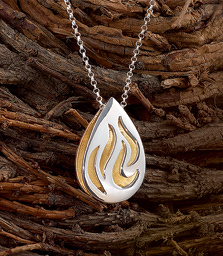 This pendant invokes the mysterious power of the bonfire - a stylized silver flame, with cutouts revealing golden sun-like interior. Rounded pendant of two joined pieces hangs freely on its chain, wavering and dancing like a flickering fire. Sterling silver with inlaid brass interior, on 18" chain. Designed in Northern Ireland by Una O'Boyle.